We’ve all heard how important it is that a business takes advantage of the mobile revolution, but there are still companies hesitating or that don’t have a very strong mobile strategy. One of the reasons small businesses are resisting marketing changes is that they are afraid of more work and that they can’t do it the right way. No matter the type of business you own, more and more people are looking to their mobile devices to find you. It’s crucial that you provide a good user experience for those who land on your mobile site as well as a fast, eye-catching incentive to choose your business over others. Optimize a small mobile site for your business. Even two or three pages is fine—the whole point of mobile is a faster user experience. Offer coupons by text message. Update your online listings so mobile users can easily find out where you are and what you do. Start using mobile ads like Google Ads or Facebook. Provide customers with an online app. If you sell products, create a mobile storefront. Simple changes can make a world of difference for your business, increasing your customer base and improving your online reputation. If you weren’t convinced before, you should be now. 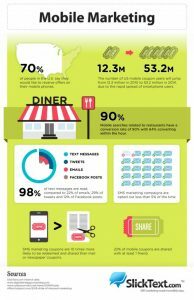 SMS marketing is a trend your business cannot afford to miss!